You are watching TV or microwaving a meal at home and the power suddenly goes off. You could be disconnected for hours until it comes back on. This is when having a generator at home can be immensely useful. This superb home generator proves that size isn’t everything. Though small and compact, the WEN 56352 runs on a powerful 212cc motor that can produce 3,000 running watts and 3,500 surge watts of power. 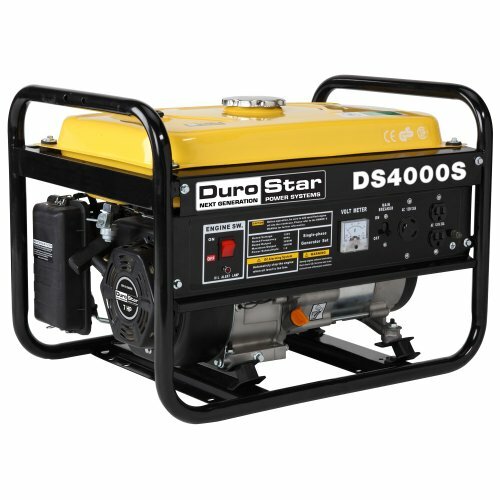 Due to the small size, this generator is easy to carry and takes up less space than your average generator. The exterior also has a computerized user interface with extensive settings readouts. It’s very user friendly, so this generator is surprisingly easy to maintain on the long run. The gas tank can hold fuel up to four gallons. At half load, run time can be as long as 11 hours. There’s an automatic mechanism to shut down the generator in case of a work overload or when the oil level is too low. Some generators keep thumping on low oil, which can cause internal mechanical damage. This generator also has foldable handles and a wheel unit that makes transportation convenient. Overall, this is a solid generator for home use that delivers the best bank for the buck. This is a CARB certified gas generator for homes. It’s more environmentally friendly than regular generators and consumes fuel only in the most efficient manner. It can generate up to 4,000 surge watts and 3,500 running watts. This Champion generator has a 196cc OHV motor inside than can run for close to 12 hours at half load. This generator mainly runs on gasoline, but there’s an extra battery as well. When the fuel runs out, you can switch over to the battery. The battery requires a 120-volt DUPLEX power outlet. 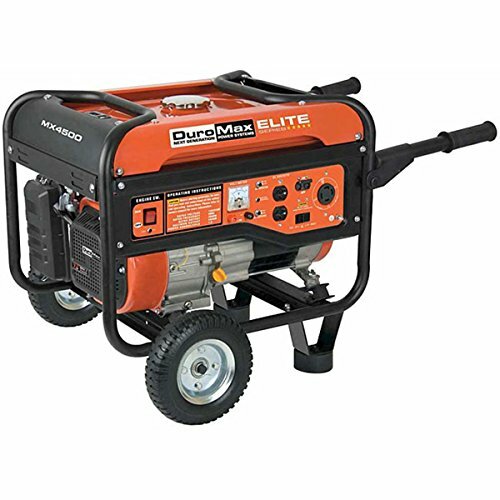 The steel exterior of this generator is extremely sturdy as well, and does not shake or vibrate when in use. That reduced the amount of noise produced by this unit. There’s a cast press component to protect the generator from harmful UV rays. The exterior is also equipped with a smooth wheelset and handles for easy transportation. This generator works without an issue in both cool and warm climates. The motor has a Cold Start mode to jump start the generator when temperatures hit below freezing. This is a reliable home generator that will immediately come into effect in case of a brownout or a power outage. This is a very though generator with a powerful generator that can keep this running at maximum capacity for 8 hours straight. This is also a noise-free generator. It’s equipped with a calming suppressor to reduce the commotion produced by the motor. 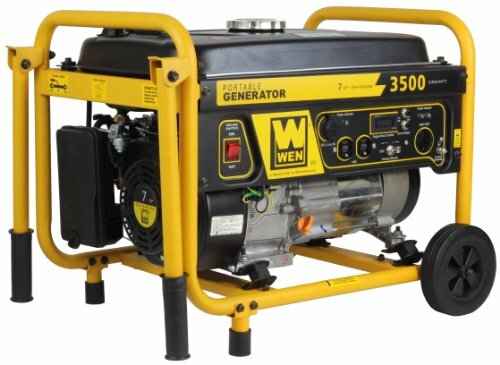 The all steel build of this generator is very sturdy and durable. The motor is 7.0 torque air-cooled to ensure optimal performance in all climates. There are a number of safety features installed to prevent damage. For example, the motor has an in-built close off for low-oil situations. This generator is programmed to stay still without moving. It’s highly fuel efficient as RPM is designed to optimize fuel consumption efficiency. The internal parts are complete tucked away inside and does not come into contact with the outside climate. This ensures longevity. The generator has an easy to read user control panel for data such as volt meter, motor shutoff, RV switch and power outlet switch. All electrical outlets are secured. This PowerMate generator is perfect for homes as it does not have a complicated procedure to set up. It’s also sturdy and will last more than a handful hot and cold seasons. The exterior is part steel to ensure stability and longevity. This generator is equipped with a reliable 13 HP Honda GX390 OHV motor that can impressively generate 8750 beginning watts and 7000 running watts. That’s an above average capacity for a home generator. If your home consumes a lot of power, this is the best generator to have. Thanks to the high capacity, this generator is highly recommended for offices as well. This home generator has a massive 8 gallon fuel tank. At half load, it can run for 12 hours straight. There are additional features incorporated to make using this home generator easy.For example, it has a fuel gauge that notifies when a refill is required. The user control board has a number of outlets, including 120 and 120/240 volt outlets. A low oil shutdown is also available. While most features of this generator are highly desirable, the generator is not CARB compliant. It may not be available in some places, like California. This is a sort of minimalist gas generator that emphasized efficiency over raw power. It’s equipped with an HP 78 drive gas motor certified by the EPA. This generator is highly CARB complaint and reduces fuel waste as much as possible. It’s also compact and quiet than most generators available in the market. When halfway loaded, this generator can produce 4,400 beginning watts and 3,500 running watts. This is enough to keep an average home powered for about 8 hours straight. This generator also features safety controls like a start arrestor. It has a low oil shutoff feature an only generates 69dB fumes, which are less harsh than the ones produced by average gas generators. The control board is easy to use and understand. It has two 120-volt electrical outlets with three prongs plus a wind bolt outlet. Overall, this is a solid product your home will greatly benefit from. Conclusion: When buying a home generator, it’s important to look beyond the raw power of the motor. Check out whether the home generator is CARB compliant and energy efficient. If not, you may have to buy a lot of fuel to power it up. Additional features like low noise generation can also be useful. If you live in an extremely hot or cold climate, make sure the generator can work under those conditions.